Today’s prize is: (1) Mr. Food Test Kitchen Cutlery Center. 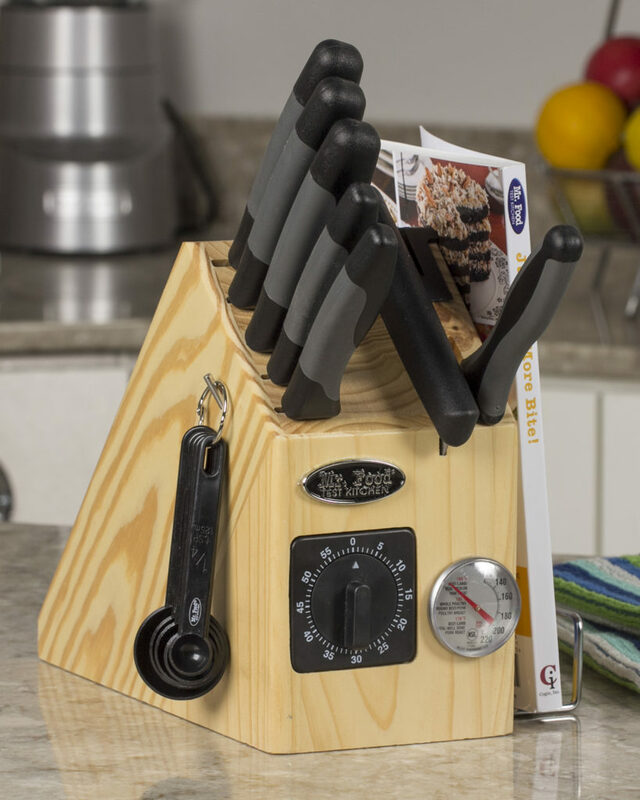 This cutlery center features a hand-crafted cutlery block that includes a paring knife, serrated spreader, pastry scraper/picker-upper, slicing knife with fork top, Santoku knife, offset bread knife, chef knife, timer, meat thermometer, measuring spoons, slide-out recipe/magazine/tablet/cutting board holder (cookbook not included), and built-in sharpener. What’s your favorite food on the Christmas dinner table? Today is the eleventh day of our 12 Days of Christmas Giveaways. You can enter each day to win the prize of the day. Contest rules and how to enter are below. You have until tonight, Thursday, December 15, 2016, at 11:59p ET to leave your comment on this blog post and on the recipe. Comments posted after that will not be counted. My favorite Christmas Dinner food is Meatballs. We always have something Italian. Side dishes. Love sweet potatoes !! My favorite is lasagna. We have it every year. If lucky enough to have it, leg of lamb, followed closely by brussel sprouts. Christmas cookies – main course is a smaller version of Thanksgiving, but the cookies are only made once a year! The sausage and eggs – we have brunch! I love the dressing with giblet gravy! Love it hope I win! My hubby is asking for ham for CHRISTmas dinner this year. I love that “Mr. 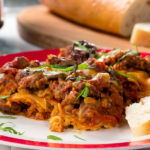 Food” always gives me easy, DELICIOUS recipes to jazz up my meals! We always have an Italian dinner and I love the garlic bread!! AND IF THERE’S ANYTHING LEFTOVER, ANYTHING FROM SANDWICHES TO SOUP IS “ON DECK”! I love the oyster stuffing I make! who am I kidding! I LOVE it ALL! and usually TRY to eat some of it ALL as well! lol but it never works out to well fo me! Happy Holidays to Everyone! My favorite food is the desert! Usually pie!! Its got to be the dressing. Im all about the dressing and my daughter-in-law makes the best ive ever eat. Thank you. Sweet potatoes with marshmallows are a must! I love a spiral ham! I enjoy sampling the various fruit salads. To me they brighten a Christmas table to make it so cheery and bright! The candied yams. Thanks for the great ham recipes!! My favorite food on the Christmas dinner table is my mother-in-law’s stuffing. Prime rib and lots of cookies and pies!! Love turkey with sage dressing. Reminds me of my Mom back in the day. My faborate thing for Christmas dinner is homemade fruit cake loaded with mixed nuts. Turkey with dressing and gravy. A standing-rib roast is the star of my Christmas table. Yum! Turkey, dressing and dumplings…all three goes together….add a veggie, rolls,and desert and it is a feast. As a kid we always had a do over Thanksgiving at Christmas and I still do too…..
My favorite is ham. We go to my onlaws and for years they would serve all different kinds of food. Now they serve ham too. The ham is the star – with the sweet potato casserole lending it’s own Joy! All the side dishes (dressing, sweet potatoes, green bean casserole and on and on and on)! 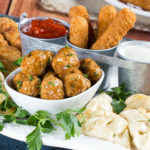 My favorite food at Christmas is sausage balls. My favorite dish was my Mother’s creamed onions. We do not actually celebrate Christmas but instead celebrate the Winter Solstice a few days before. 😀 The favorite thing that we make for Winter Solstice is a toss up between our vegetarian BBQ meatballs and our smoked Gouda fondue. Both are just so delicious that I can’t pick one! hahaha! My favorite is a ham cooked just like the one in today’s blog. A big ham is my favorite with dressing coming in a close second place! I always look forward to our Christmas day feast of surf and turf, prime rib and lobster. My favorite Christmas dinner food would be spiral ham. The knife set looks amazing. Best one I have seen! My fav dinner is chicken Alfredo with asparagus and garlic butter and a piece of garlic bread with a piece if chocolate cake with hone made whipped cream on top. To drink I love strawberry lemonade. My favorite dishes are my mother’s homemade sage dressing and my peanut butter pie. This year, prime rib for Christmas Day. But I always get a spiral ham to bake and use it for all kinds of dishes, soups and sandwiches. Green bean casserole is my favorite. Grandma’s dressing and Rudy’s cream corn! Spiral Ham, a must have! My favorite Christmas dinner is held on Christmas Eve and is a pork loin dinner with all the fixins. This is a dinner my Mother always made since she was Norweigian and came here from Norway. We still keep this going since she is no longer with us, the entire family comes and we remember her and all the passed family members. A few years ago we switched to apps instead of dinner of Christmas day because we were always full by dinner time. My favorite appetizer is my sister’s cheese ball and the bacon wrapped chestnuts. PIE! Does pie count? Please tell me pies counts. Pie’s gotta count. Love pie. Did I mention I LOVE pie? My favorite in our family is baked ham,sweet potatoes & a pasta dish in this Italian family Top it off with a glass of homemade wine…..
My holiday favorite meal for Christmas is beef Wellington. I learned how to make it in culinary school when I was 18 and I made it for my parents and brothers for many years. I love the creamed spinach and the mashed potatoes. my favorite holiday meal is anything made with family. My parents are coming to our house this year. My mom and I are making a turkey on Christmas eve and brunch on Christmas day! I can’t imagine Christmas Dinner without Prime Rib & Ham! Just started back to cooking and tired of dull knives!! The stuffing. The recipe was handed down from Great Gram to Gram to Mom to me.it brings back memories when everyone was still here. Oh My…. For Christmas dinner I love Herb Crusted Prime Rib or Beef Tenderloin ( both very easy) with Twice Baked Potatos or Macaroni & Cheese w/a Sweet Roll Crumb Topping ! I don’t have one favorite. I like the combination of turkey, mashed potatoes, stuffing, and whatever else we have. It’s just food… I don’t care what we have as long as we are together as a family. We make Mexican food. This Year will be tacos and faulatas. My favorite thing are the pineapple rings that were baked on the ham with the sticky honey glaze. My fav is sweet potato casserole! For Christmas this year we’re going to fix ham! I love all the sides that go with it…sweet potatoes, any way they are prepared and, of course, southern style mac and cheese!! A Dearborn Ham! Oh my, they are so yummy! The roast beef is always a favorite at the Christmas table! Ham, sweet potatoes, and green bean casserole is my favorite Christmas dinner!!! I love the dressing or some call it stuffing. I look forward to it every year. Love It! My favourite food is the turkey stuffing!!! Christmas cookies! I spend two whole days in the kitchen every year, making cookies to be mailed to family. Very hard to choose a favorite, but because of all the sweets through the season, I am ready for the vegetables such as broccoli shrimp mushroom and rice with a cream cheese sauce, brusselsprouts with bacon, cheesy corn casserole. Then I want my pie which is eggnog pie. I love the Cherry crusted Ham dinner. I did it for Thanksgiving and LOVED IT!!!! But for Christmas I love to make Prime Rib. I have mad this for years now. yum yum yum!!!!!!! We all get together on Christmas eve and I fix a big ham and sweet potatoes, and a special apple salad that everyone likes. This is always an easy choice for me. My mom’s southern cornbread dressing is my favorite! Hot roast beef sandwiches is a favorite with my family. Would love to have that knife set! I am all about the potatoes! mashed and sweet potatoes for me! Ham dinner is my favorite. Love the Mr Food recipes. My favorite holiday dish broiled Brussels sprouts with bacon and candied pecans. Congratulations, Melissa! You are the winner of the eleventh day’s prize! We’ll be sending you an email shortly, so you can claim your prize. Please respond as soon as possible, so we can send it your way. My favorite holiday food is sweet potato casserole, the way my grandmother used to make it, with marshmallows on top. Ham is most definitely my fave holiday food! The dressing is my favorite! We do Christmas Eve dinner with Surf & Turf! There are to many good foods that we have but tops would probably be sweet potatoes with marshmallows on top, than lefsa, ham, scalloped corn, stuffing, hash brown potato casserole and to top it off a peppermint dessert recipe that my mom used to make. I love stuffing! I always wonder why I don’t make it more often–I’m sure I would enjoy it just as much in July! My all time favorite was a Swedish noodle dish my Aunt made. Sadly, we no longer do the big family get togethers. But I can taste it in my memories!! I love Mashed Potatoes with or without gravy. That would be turkey, ham, stuffing and cranberry sauce. My favorite food is always the meat dish, whether roast beef, smoked brisket, turkey or chicken, or ham. I love it all! My favorite food on the Christmas table would be Grandma’s Allspice Potatoes! Ham is my favorite Holiday meat! I “cook” a spiral in my crockpot every Christmas. It would be a prime rib roast, all juicy and wonderful, with all of my family sitting around the table. Really nice Cutlery center !!! My favorite food on Christmas day is always the home made stuffing!! its sooo good!! Well, if it was possible… prime rib! Coming from the UK my favorite dish on the Christmas table is trifle–layers of rum soaked sponge, made from scratch custard and fresh whipped cream with maybe raspberries and slivered almonds–yum! Farmhouse Glazed Ham is a recipe I will try. Looks yummy!! My Christmas ham! I make it every year, and it is by far my favorite part of the holiday meal! Tourtierre (pork pie)….it is a French-canadian tradition handed down from dad. It’s ham for Christmas, along with mashed potatoes, green and yellow beans I froze from my garden in the summer and some New England baked beans. My mom’s Scalloped Corn. It is delicious fresh, but it gets even more addictive as leftovers. I look forward to it every year. My favorite this year is going to be the ham for Christmas dinner. We usually do turkey, but decided to switch things up this year. The Christmas ham is my favorite! My Christmas favorite is the sweet potatoes! I always make a ham. The family loves it and I make all of our favorite sides! I am torn between turkey and pumpkin pie, both of which I could eat nonstop as long as someone else is doing the cooking. My Christmas table has to have turkey, mashed potatoes, homemade noodles and oyster dressing. My favorite food is my Cajun smoked turkey with turkey dressing. I’m all about the green bean casserole! YUM! I love turkey and cranberry sauce…. Love your show! I watch it everyday!!!! PRIME RIB & Brussel sprouts, it’s heaven!!! This set is amazing. What a fab prize, thank you! I love the ham on our Christmas table. Awesome prize!! Turkey, dressing and my special Cranberry Relish. YUM!! Favorite is cornbread dressing and gravy. I love ham and deviled eggs. Baked ham at our feast, and of course pierogi. I would Love to WIN THIS!! Hook for measuring spoon , Good Idea !! & the Timer In the Block, NEAT ! Pineapple, brown sugar spiral ham is my favorite. We have homemade pasta before the main meal usually roast beef. my favorite food on the christmas holiday table is prime rib with garlic mashed potatoes. there are so many recipes for baked ham. but I have never seen the recipe for baked ham with a cheese crust before but it looks like it would be good to try. it looks very interesting like maybe it would taste similar to the toppings on a hawaiian pizza. A good juicy ham cannot be beat, It is one of the most versatile meats. My absolute favorite is au gratin potatoes. I rarely make them, and they are so delicious. Since I’m a vegetarian I make quite a few veggie side dishes, but the au gratin potatoes are the best. One of my favorites is a dish that my mother taught me, it’s a type of Shepard pie. Her mother taught her and now I have taught my son. We are passing this recipe from one generation to another. We also do not celebrate this holiday. We are happy to have good food on the table any time. And it’s a much better meal if there is a crisp green salad. My favorite food on the Christmas table has to be mashed potatoes and gravy. Always has been the best comfort food too! Candied Yams – all that melted brown sugar, melted marshmallows….they are the best! I love the Prime Rib! The corn casserole. OMG…yummy to my tummy. Baked ham and potato salad. My favorite is chili. I know its not traditional, we just throw a chili in the crook pot in the morning. Quick and easy so we can enjoy time with family/friends, and watching kids play with all their new stuff. Instead of slaving away on dinner and the clean up afterwards. I don’t have a favorite. I love it all, as well as preparing the feast for my family! My favorite food on the Christmas dinner table is baked ham. My favorite is the traditional hot goat meat peppersoup. My favorite Christmas dinner is a baked ham with sweet potatoes and asparagus. 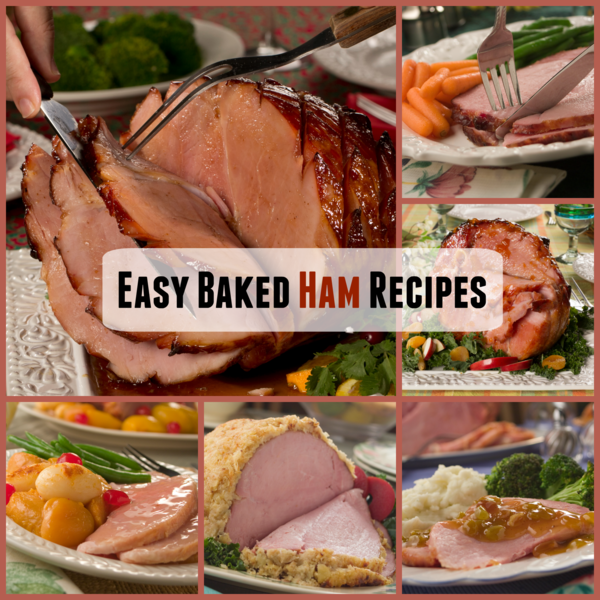 The recipe you have on this blog for the ham is similar to the one I make. Oh, and lots of cookies around for snacking. the cookies, yummy! need knives so bad, I have been a cook for 40 plus years and have never had a good set of knives at home, that would be a huge treat! Never know at my house – Honey baked ham with potatoes au gratin if it’s a big family dinner,if it’s just a quiet day at home,there’s always a lot of good Chinese takeout or pizza waiting to be ordered . Honey & Spicy Mustard Glazed Ham! I love ham and pineapple together. My favorite food is apple pie. my favorite Christmas table foods are sweet potatoe casserole, and cranberry congelled salad. My favorite dish on the holiday table would be the canday/cookies treats tray! Yummy! My favorite Christmas food item is pasta in red sauce (yes I’m weird). ….. The pineapple baked ham sounds delish. Maple glazed ham and fruit is so good. Boiled shrimp and cream cheese crab dip with crackers. The ham recipe would be a good choice too. My favorite is turkey with cranberry sauce. The combination is awesome. My favorite food on the table is “Grammy’s homemade Noodles & Chicken”. It’s a loved dish by many of the family! Can’t wait to dig in! Sweet Potatoes and stuffing, and the ham!